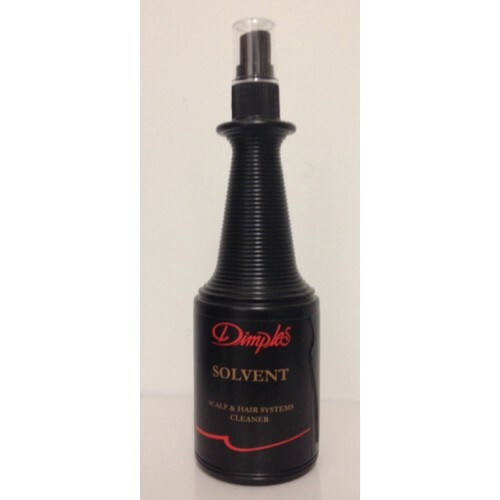 This DIMPLES SOLVENT SCALP AND HAIR SYSTEMS CLEANER is a specialised treatment which will remove adhesive build up in a fast and effective way. Using traditional ingredients, gentle to your skin and scalp, Dimples Solvent reacts effectively on most tapes or soft bonds and can simply be rinsed off with soap and water. Directions for use: Spray a light amount directly onto the adhesive area. Allow for up to one minute reaction time depending on the adhesive build up. Wipe or brush off residue. Rinse with soap and water.